Discounts are available for Inverted Abasic Site! 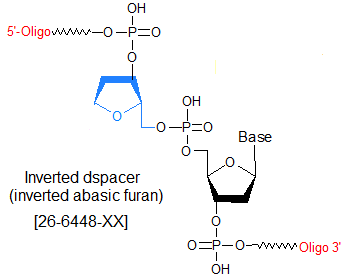 Inverted Abasic Site (dSpacer abasic furan) is primarily used to block the ends of the oligo. it can also be used for structural studies in comparison to abasic furan. dSpacer (abasic furan) is a tetrahydrofuran derivative, in which a methylene group occupies the 1 position of 2�-deoxyribose. dSpacer is commonly used to mimic an abasic site in an oligonucleotide. In DNA, abasic sites are generated by hydrolysis of the glycosidic linkage to the nucleotide base, leaving just the sugar-phosphate backbone at that position. In the cell, abasic site formation occurs after a spontaneous depurination/depyrmidination event, by UV ionizing radiation, or as a Base Excision Repair (BER) intermediate (1, 2). Because such sites are fragile, they are easily susceptible to single-stranded/double-stranded breakage, and if not repaired by the BER mechanism, abasic lesions often lead to mutation by translesion synthesis during replication. The particular base incorporated opposite the lesion varies depending on organism and environmental conditions (3). dSpacer is used as an abasic site mimic in synthetic oligonucleotides because it not only is structurally very similiar to the natural site, but it is considerably more stable, and thus can tolerate the chemical conditions used in oligo synthesis and purification (4).One or more consecutive dSpacer modifications can also be used simply to provide varying amounts of separation between different parts of an oligo sequence. 1. Lindahl, T. Instability and decay of the primary structure of DNA. Nature. (1993), 362: 709-715. 2. Nilsen, H., Krokan, H.E. Base excision repair in a network of defence and tolerance.Carcinogenesis (2001), 22: 987-998. 3. Lehman, A. Replication of damaged DNA by translesion synthesis in human cells. FEBS Letters. (2005), 579: 873-876. 4. Takeshita, M., Chang, C.N., Johnson, F., Will, S., Grollman, A.P. Oligodeoxynucleotides containing synthetic abasic sites. Model substrates for DNA polymerases and apurinic/apyrimidinic endonucleases. J. Biol. Chem. (1987), 262: 10171-10179.